Casino International | The Casino of the Future… Now! The Casino of the Future… Now! Casino International > Features > The Casino of the Future… Now! With so much discussion on the “Casino of the Future” it’s important to consider what casino operators can do today to test concepts, attract new customers, and generate incremental revenues. 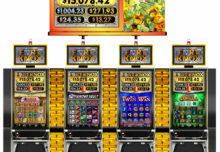 With skill-based video game gambling machines live in multiple jurisdictions across North America, data is beginning to be available that will offer added insight on what this coveted customer (Gamers, Millennials, and tech-savvy patrons) desires and how to develop experiences that appeal to the next generation of casino patrons. This article brings together opinions and data from both operators and manufacturers to present a vision for implementing the casino of the future, now. First, it’s worth considering the value of programs designed to reimagine the gaming floor and to attract non-gaming casino customers (such as those frequenting nightclubs, bars, and restaurants) as well as true “net new gamers” – those who currently do not regularly visit casinos. While slot machines generate up to 75% to 80% of casino revenues in most jurisdictions worldwide, the industry outlook suggests the average slot customer has aged 5-10 years over the past decade, forcing Casinos to both maximize revenues from current core customers as well as looking for ways to increase their appeal to a younger audience that represents the future of gaming. 1999 was the last year in which traditional gaming revenue outpaced non-gaming revenue from entertainment offering in Las Vegas. Today, the Las Vegas strip generates only 35% of total revenues from gambling. This trend is echoing worldwide as an aging demographic of traditional gamblers is not regenerating. Generations that grew up with interactive entertainment and social media are questioning the appeal of the traditional gaming floor. One of the key levers available to Casinos is the unique value proposition the posses with their massive investments in world class properties, unparalleled levels of hospitality and extensive amenities that brought together make for a world- class VIP experience. Operators everywhere are asking themselves – As innovation develops for future gaming offerings, how can today’s casinos deliver a next generation experience, today? How can a staged, evolutionary strategy provide operators with a path from today’s offerings to tomorrow’s opportunities? While many casinos are interested to implement a “casino of the future” they often find themselves with a current constrained product offering for skill-based games and video game gambling. However, by combining these new innovations along with traditional products that align with this demographic profile, operators can now find a path to an immediate implementation that provides first-mover advantages to those having the vision and operational know-how now. Let’s begin by considering key attributes for the casino of the future, including the creation of a seamless experience between gaming and non- gaming, implementing a greater degree of technology deployment, offering products that appeal to the video game generation, evoking a “lightness” of design similar to high-end retail, diversified experiences, brand integrations, and the continuing to evolve a top-tier hospitality experience. It therefore becomes possible to imagine an evolved gaming floor that combines these qualities today. Who are these targeted patrons? Based on industry data from current skill-based games, it’s almost an even gender mix of 55% males and 45% females, and an average age of 42-47 years old. This presents a meaningful opportunity for crossover between current slot customers and younger patrons frequenting entertainment offerings. What games are these patrons playing? Based on data from rated patrons, video game gamblers are not only playing these new, innovative products but are also playing traditional casino games such as poker, blackjack, and roulette as well as branded video slots. Data shows there is a particular crossover with newer games such as The Walking Dead, Game of Thrones, and Britney Spears from manufacturers such as Aristocrat, further illustrating the value to reconfigure certain areas of the floor to combine these offerings while differentiating from, rather than alienating them, at today’s typical casino patron. Of these games played by skill-based gamers, 21% of play was poker, 8% was roulette and blackjack, and the majority of play (70%) was video reel slot machines. Proceeding to seamlessly layer in retail with boutique food and beverage, along with a combined entertainment experience with DJ’s, we begin to see the immediate potential to reconfigure the gaming floor without the need for further product offerings. This creates the ability to drive earlier adoption and retention of new customers directly leads to generating considerable incremental revenue for casinos. The next step would be the addition of esports and content programs, such as those being pioneered by Tropicana, Caesars, MGM, and Downtown Grand. There is no longer skepticism about the importance and value of these possibilities but instead there is now interest in how to initiate strategies that leverage these industry trends. The key is developing a daily, year-round offering that makes use of casino infrastructure and expertise without relying too heavily on third-party partners. While there are a growing number of “tentpole” esports events each year, these very customers are looking to gather, socialize, gamble, and spend meaningful dollars on a regular, ongoing basis. As such, the opportunity should not be left untapped to afford this growing group of customers a reason to visit and enjoy all that casinos have to offer outside of one-off esports or entertainment events. Additional initiatives may include cutting-edge amusements such as virtual reality and interactive sports, similar to those currently being offered at Level Up in Las Vegas. Casino operators can also build on their history of innovation and unique product offerings to deliver a meaningful, authentic experience for these new customers. It now becomes easier to imagine a strategy with an acceptable outlay requirement nd appealing return on investment that provides an immediate product along with a path to ongoing innovation. The next 3-5 years will be a watershed time in our industry as the speed of innovation adoption exceeds previous decades. Customers who grew up playing video games and interacting with social media are looking for a greater degree of engagement than previous generations. Casino operators dedicated to remaining ahead of the market will have the ability to mitigate risks while maximizing profits along with making optimal use of their considerable infrastructure investments. As is usually the case with new initiatives, it’s likely less important for casinos to get the exact configuration of the casino of the future perfect now – and instead to leverage the opportunity to gather early data, make quick iterations, grow communication with new customers, and build programs for today and tomorrow. Let’s Play – with IGT!